From time to time I hear great stories from others that feel like they need to find their way out to the larger world. I wanted to share a post by April Schmaltz, who is our VP, Marketing at TMG Financial Services. 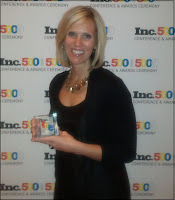 I thought this was a great summary of her personal lessons learned at the Inc. 500 conference, where she picked up some hardware for us as one of the fastest growing private companies in America (shameless plug #1). Also, if this is your first time to PlanBPhilosophy.com, take a moment to view past posts and subscribe via email or RSS (shameless plug #2). Sometimes life is a little bit like the teacher on the childhood Charlie Brown cartoon specials. All you hear is noise. Noise that sounds remarkably like “Wanh, wanh, wanh,wuh-wahn, wahn” especially if it doesn’t help you cross a task off your to-do list. But what if you take a moment to listen? What do you hear? What do you learn? I have prided myself on being a life-long learner, with the ability to adapt and grow not only as a leader in our company, but also in my personal life. However, with many responsibilities at home and at work, there can be a tendency to push off what doesn’t need to be heard or done right now until later. "Later" recently happened for me at the annual Inc. 500 conference, where TMG Financial Services received its official award for being one of the fastest growing companies in the United States. It wasn’t necessarily the easiest time for me to step away, but it was an honor to be selected to attend and accept the award on behalf of our organization. So, I tried to close off my mind about what I was leaving stacked on my desk, and went to the conference to accept our award. And, I came away from the conference with so much more than I anticipated. With each speaker better than the one before, I found myself taking many notes. And, when that wasn’t enough, I purchased a camera to capture some of the truly inspiring conversations and moments during the conference. While I was checking in with the office to make sure things were moving as they needed to, I made a conscious effort to focus on listening and learning. See, I had an opportunity to listen to a group of distinguished speakers from across the country talk about their road to success and provide insight into their journey—possibly a once in a lifetime opportunity to hear some of them speak. I walked away inspired by so many ideas to apply to my own personal and professional leadership development, as well as a wealth of ideas that apply to how we conduct business at TMG Financial Services. What I learned, or perhaps re-learned in some instances, are themes that we all inherently understand, and are relatively simple. Below are some of my favorites. Lead for Others. Take the time to ensure the people who work with you have the opportunity to grow (professionally and personally). This is not easy when at times it seems tough enough to keep your own head above water, but empowering your team to accept more responsibilities ensures you are a high-functioning team that is efficient and effective. "You are not a leader until you make it your job to look after others"-- Simon Sinek, author of Start With Why. Good Vibes Are Contagious. There is no doubt that it is easy to get mired down in the day-to-day slog, especially if things aren’t going as you expected. Step back. Take a deep breath. Re-evaluate, if necessary. Focus on how you can make something work, not why it isn’t working. And, do it in a positive manner. We could all use a little more positivity in our lives! The CEO (Chief Executive Optimist) from Life Is Good, Bert Jacobs, said it best, "Optimism can take you anywhere." Widen Your Decision-Making Process. "When you have a decision to make, fall in love twice. Push yourself to find two good options rather than fall into a rationalization trap. OR, run the 'Vanishing Options Test'. Make all of your current options vanish. What other options can you come up with?" -- Dan Heath, co-author Switch, Made to Stick and Decisive. stated was worth considering is Suzy Welch’s 10-10-10 approach. Decisions are often made on a short-term emotion. Ask yourself, what are the consequences of your decision in 10 minutes? 10 months? 10 years? Enchant Others. "The key to success is to achieve the quality of Apple, the trustworthiness of Zappos (free shipping) and the likeability of Richard Branson (owner of Virgin Airlines)" -- Guy Kawasaki, founding partner and entrepreneur in residence, Garage Technology Ventures; author, Enchantment: The Art of Changing Hearts, Minds, Actions. Have the Aptitude to Never Give Up. When Captain Mark Kelly spoke about his inspirational career, he emphasized the importance of aptitude and practice. In his first months as a naval aviator, he discovered that he was not a natural 'Maverick'. (In fact, he thinks Tom Cruise would have flown the plane better than he did at the time!) But with dedication and perseverance, he achieved nationally recognized success. Captain Kelly also talked at length at how he was able to apply his ‘never give up attitude’ to his personal life, as he and Gabby have faced many challenges on her road to recovery. -- Mark Kelly, retired astronaut, U.S. Navy captain and naval aviator; co-author, Gabby: A Story of Courage and Hope. There has been a lot of talk lately about remaining relevant, and while that has largely been in relation to keeping a business moving forward, perhaps we should also look at how we can remain relevant as leaders and employees. Sure, we can still move forward if we put our heads down and blaze towards accomplishing the next task on our list. But, it isn’t necessarily the most effective, efficient way. Stopping and thinking (that involves listening and learning) helps us move forward with purpose and energy. It helps us grow as individuals. Take a break for a minute or two. Get to that book, magazine article, conference or whatever inspires you. You may be surprised at the results. April Schmaltz is the vice president of marketing for TMG Financial Services.